Kala Chana Chaat | Black Chickpeas Healthy Salad - Eat this as a subzi or snack. 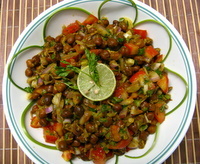 Kala chana chaat or black chickpeas salad is a very healthy snack food. It can be eaten as a kala chana subzi as well. The beauty of this recipe is that it is 'completely oil free'. Yes, made without using a single drop of oil this chickpea salad is light on the stomach and a treat for the palate. A 'chaat' is a typical Indian savory snack which can contain a wide variety of ingredients. It is essentially a combination of hot, tangy, spicy and sweet flavors. Chickpeas are a helpful source of zinc, folate and protein. They are also very high in dietary fiber and hence a healthy source of carbohydrates for persons with insulin sensitivity or diabetes. Chickpeas are low in fat and most of this is polyunsaturated. India is the biggest producer of chickpeas. The major well known varieties are white chickpeas also known as kabuli chana or garbanzo beans, brown or black chickpeas known as kala chana and green chickpeas also know as hara chana. The chickpeas should be soaked in water overnight. Boil the chickpeas with 1 cup of water in a pressure cooker until done (will take about 2 -3 whistles). Strain and cool to room temperature. Transfer the kala chana in a bowl and add the chopped onion, chili, tomatoes and coriander. Mix well. Add the lime juice, salt, coriander and chat masala. Toss to mix nicely. Garnish with a lime slice, coriander leaves and tender coriander stalks. Serve cold or hot with bread or eat just like that like a salad. Don't throw away the water from the boiled chickpeas. It is very healthy as well. Just add a little salt and lime juice to it and drink it. Contains a lot of iron. Enjoy the kala chana chaat!